The Blackpool & District Youth Football League Under-15 competition is hotting up, with Kirkham Juniors Reds losing for only the second time this season – to FC Rangers Blues – opening up the title race. 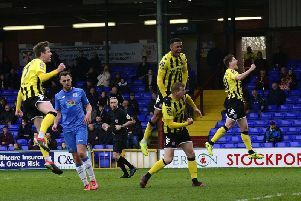 The Reds took an early lead through winger Lewis Weaver with a great solo run and finish from inside the six-yard box, but they couldn’t capitalise further on their early pressure and were ultimately punished for several missed opportunities from close range, with Airon Turner and man of the match Reece Johnson both hitting the crossbar in the second period. FC Rangers got the equaliser when a cross from wide on the right by Daniel James found its way into the top left corner. The Reds blasted a free-kick into touch and the resulting throw found FC’s Ollie Leggett, who promptly curled a neat winner. AFC Blackpool played host to Poulton FC and goals from Theo Mihell, Sol Mattatia(2), Tom Gutt and Nico Cobb sealed the win for the visitors to close the gap on the leaders. Squires Gate Reds travelled to Thornton Cleveleys Whites and came away with the win to also stay in contention for the title. In the Under-18s division a Rob Flannigan double and a Joe Curry goal gave Foxhall Hoops the win against Clifton Rangers in a very competitive match which was a compelling watch for both sets of spectators. Thornton Cleveleys have started to climb the table and defeated Poulton Town. In the U14 competition, Connor Ashton, Oliver Broughton and Adam Stafford scored as Wyre Juniors won at FC Rangers, for whom Joshua Leach scored. Alfie Douglas scored a hat- trick as Poulton Town won away at Warton Typhoons to keep up their winning streak. Kobe Moore and Regan Malone grabbed a brace each and then further goals came from Thomas Powl and Sean Davies-Ward. Blackpool overcame being a player down for most of the game, having sustained an injury just after Grove scored from Hill’s pass in the first minute. In tough conditions, a Blackpool side captained by Chan Delaney gave everything to keep their lead. But with just over 10 minutes to go, Siddall joined the midfield and Grove’s corner was tapped in by Porter. The same two players combined again, with Grove crossing and Porter converting. In the last minute, Siddall beat two players and drove a great shot past the Fieldway keeper from wide out to make it 4 -0. Jackson was named Blackpool player of the match for yet another top-quality performance in goal. YMCA met a very strong Blades outfit in this PDPL Cup-tie. YMCA did manage to carve out some chances and Henry Brooks scored their goal, though Blades were more clinical in front of goal and took a 3-1 lead into half-time. The Blades continued to have the initiative and added further goals, though YMCA put plenty of effort in. YMCA proved too strong for their South Fylde rivals in this PDPL Christmas Plate match. The visitors cancelled out and early goal by YMCA but three further goals by the home side put them 4-1 ahead at the interval and YMCA added a further five goals in the second half. William Wyles claimed a hat-trick, with Oliver Atherton, Deakon Stewart and Sammy Curran all bagging pairs, Chris Guest was also on target. This was a very even contest in the first half at Seafield Road, with both teams finding clear-cut chances hard to come by. Poulton did eventually break the deadlock though with a fine goal but YMCA quickly responded when Felix Twitchet headed home a corner superbly at the far post to make it 1-1 at the break. After the restart oulton began to get the upper hand and they added three further goals to run out comfortable winners despite Jamie Jay in the YMCA goal producing an outstanding display. YMCA took the lead after just 20 seconds at Fleetwood with a strike by Cameron Clark. The rest of the first half was even aS a goal by Theodore Mawene and a reply from the home side gave YMCA a 2-1 lead at half-time. The game continued to swing from end to end, and although the home side netted twice more YMCA did likewise through the impressive Riley Morgan and Will Stott to earn a slender victory in a very entertaining contest. An excellent first-half display paved the way for this YMCA victory at Bispham. With some excellent football they raced into a 4-1 lead at the interval but it was a much more even contest after the restart and YMCA just added one further goal. The impressive Thomas Shuttleworth netted twice, with Charlee McGuiness, Harry Gledhill and Ben Wilson completing the scoring. The Preston club proved too strong for YMCA at Seafield Road and were in control throughout. Anya Dewin notched YMCA’s sole reply.